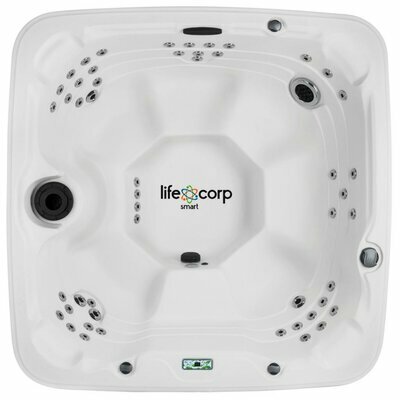 $1999.99 Lifesmart 4 Person 12 Jet Rock Solid Simplicity Plug & Play Spa - dealepic . 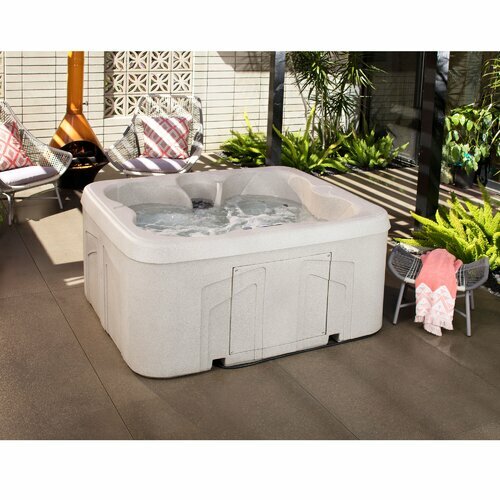 This Lifesmart 4 Person 12 Jet Rock Solid Simplicity Plug & Play Spa is an excellent addition to your backyard. This plug and play spa features twelve high therapy jets that provide you a perfect massaging experience. This spa is made from a superior quality material that makes it durable. The comfort dial permits you to balance of air and water. A digital topside thermostat adjust the temperature of this spa. It also includes a spa light with interchangeable mood lens caps. This spa has a seating capacity for four people and can hold up to 190 gallons of water. It has a child-safe locking cover. The 4-Person 12-Jet Rock Solid Simplicity Plug and Play Spa by Lifesmart is ideal for indoor and outdoor use.